Ibis are a species of wading birds found throughout the world, especially in the more temperate regions of the southern hemisphere. Ibis are well known for their long beaks and necks used for getting food from the water. There are 30 different known species of ibis varying in color and size, from the tiny dwarf olive ibis to the giant ibis. The ibis has a long neck with a large, down-curved, pointed bill, round body, long legs and partially webbed feet. Ibis can be white, black, pink, brown, gray or orange-red, depending on the species, diet and habitat. Some parts of the ibis body (often the face and throat) are featherless. Patches of bare skin are deep red during the breeding season. Ibises inhabit areas where there are large amounts of water. The ibis feeds on aquatic animals found in swamps, wetlands and marshes. The ibis is an omnivorous bird, eating both plants and animals. When aquatic animal are abundant, ibises eat a more carnivorous diet. Ibises hunt fish, reptiles, insects, amphibians, small mammals and crustaceans, picking their food from the mud with their long, pointed beaks. Ibises can breathe while their bills are submerged in water because their nostrils are located at the base of their bills. Ibises are sociable birds that gather in large flocks. Colonies can be composed of thousands of ibis, offering better protection against predators. The ibis is active during the day and sleeps at night (diurnal). Despite their large size, ibises often rest in trees rather than on the ground. Ibises are not very vocal, with the exception of breeding season when they make squeaking and wheezing noises. 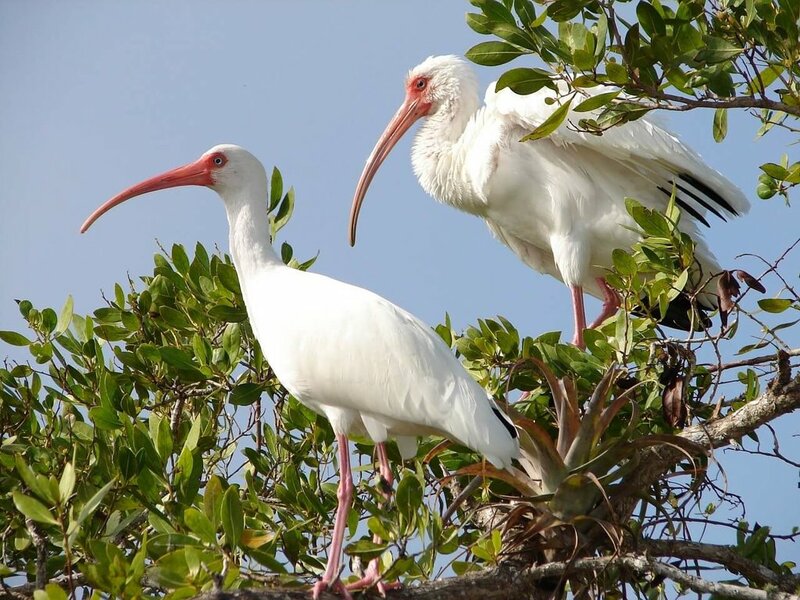 Female ibises build nests of sticks and reeds in trees, bushes or on cliffs during mating season. Ibises usually choose to nest near large amounts of water, such as lakes and rivers, with other species of water-birds. The female ibis lays up to the 3 eggs. Both parents participate in incubation. Eggs hatch following an incubation period of a few weeks. Ibis babies are dependent on their parents. They quickly develop and leave the nest in about 6 weeks. They stay with their parents until they learn to be independent. Ibis live up to 15 years in the wild. Ibis are relatively large birds and have few natural predators. Large birds of prey attempt to steal their eggs and chicks. Snakes, wild cats and foxes are known to hunt ibis. Ibises are threatened with pollution and pesticides, hunting and habitat destruction. Some species, including the crested ibis and northern bald ibis, are endangered or critically endangered.